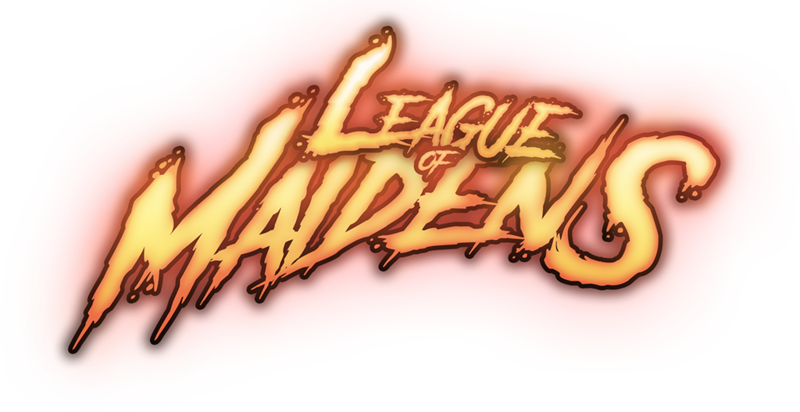 League of Maidens (the “Game”) is a 3D free-to-play online game for PC developed and operated by Maiden Gaming, Inc., a North Carolina Corporation (“Maiden Gaming”). For purposes of this License Agreement (defined below), “you” and “your” mean the user of the computer on which the Game will be or has been installed. PLEASE READ THIS END USER LICENSE AGREEMENT (THIS “EULA” OR “LICENSE AGREEMENT”) CAREFULLY. BY CLICKING THE “ACCEPT” BUTTON BELOW OR USING THE GAME OR INSTALLING THE GAME CLIENT SOFTWARE (THE “SOFTWARE”), YOU AGREE THAT THIS LICENSE AGREEMENT IS ENFORCEABLE LIKE ANY WRITTEN CONTRACT SIGNED BY YOU. IF YOU DO NOT AGREE TO ALL OF THE TERMS OF THIS LICENSE AGREEMENT, CLICK ON THE BUTTON THAT INDICATES THAT YOU DO NOT AGREE TO ACCEPT THE TERMS OF THIS LICENSE AGREEMENT, AND DO NOT COMPLETE INSTALLATION OF THE SOFTWARE. BY ENTERING INTO THIS LICENSE AGREEMENT, YOU REPRESENT THAT YOU ARE AN ADULT AND HAVE THE LEGAL CAPACITY TO ENTER INTO A CONTRACT IN THE JURISDICTION WHERE YOU RESIDE. Subject to the terms and conditions of this License Agreement and your agreement therewith, Maiden Gaming hereby grants to you and you hereby accept a limited, non-exclusive, non-transferable license to internally install and execute solely as a component of the Game (i) the Software and related explanatory materials (“Documentation”); and (ii) any Software upgrades, patches, subsequent versions, and updates (collectively, “Updates”) licensed to you by Maiden Gaming. The Software and the Game are provided for your individual, non-commercial, entertainment purposes only. Except as may be expressly permitted by Maiden Gaming, you may not sell, copy, exchange, transfer, publish, assign or otherwise distribute anything you copy or derive from the Software or the Game. E. Use any unauthorized third-party programs that interact with the Software in any way, including but not limited to, “mods,” “hacks,” “cheats,” “scripts,” “bots,” “trainers,” or automation programs, or any third-party programs that intercept, emulate or redirect any communication between the Software and Maiden Gaming, or that collect information about the Game by reading areas of memory used by the Software to store information about the Game. L. Selecting a Guardian name that is falsely indicative of an association with Maiden Gaming, contains personally identifying information, infringes on the proprietary or non-proprietary rights of third parties, or that is offensive, defamatory, vulgar, obscene, sexually explicit, racially, ethnically, or otherwise objectionable. You may not use a misspelling or an alternative spelling to circumvent this restriction on Guardian name choices. Maiden Gaming may modify any name which, in the sole and exclusive judgment of Maiden Gaming, violates this provision without further notification to you, and may take further disciplinary measures, including Account termination, for repeated violations. When you are using the Software, the Software may monitor your computer’s random access memory (RAM) for unauthorized third party programs prohibited by Section III.E that interact with the Software and/or the Game. In the event that the Software detects such an unauthorized third party program, information may be communicated back to Maiden Gaming, including the name of your Account, your internet protocol (IP) address, details about the unauthorized third party program detected, and the time and date that the unauthorized third party program was detected, along with the hardware specs and performance characteristics of your computer, with or without additional notice to you. No other information about you or your computer will be communicated to Maiden Gaming with the Software. If the Software detects the use of an unauthorized third party program, your access to the Game may be terminated with or without additional notice to you. A. The Software and the Game. Maiden Gaming may provide Updates to the Software that must be installed for you to continue to play the Game. Each time you launch the Software to play the Game, you hereby give your consent to Maiden Gaming to remotely install any Updates to the Software that resides on your computer, with or without additional notification to you. B. License Agreement. Maiden Gaming reserves the right, in its sole and absolute discretion, to revise, update, change, modify, add to, supplement, or delete certain terms of this License Agreement as the Game and the law evolve; provided, however, that material changes to this License Agreement will not be applied retroactively. Such changes will be effective with or without prior notice to you. You can review the most current version of this License Agreement by clicking on the “EULA” link located at the bottom of the Site. You are responsible for checking this License Agreement periodically for changes. If the Software requires an Update at the time you launch the Software to access the Game, you will also have the opportunity to review and to accept or reject the current version of this License Agreement. If any future changes to this License Agreement are unacceptable to you or cause you to no longer be in agreement or compliance with this License Agreement, you may terminate this License Agreement in accordance with Section IX and must immediately stop playing the Game and uninstall the Software. Your continued use of the Game following any revision to this License Agreement constitutes your complete and irrevocable acceptance of any and all such changes. This License Agreement is effective until terminated. You may terminate this License Agreement at any time by notifying Maiden Gaming of your intention to terminate. Maiden Gaming may terminate this License Agreement at any time, for any reason or no reason. Upon termination, whether by you or Maiden Gaming, the license granted to you in Section I shall immediately terminate, and you must immediately and permanently remove the Software from your computer’s permanent memory and destroy any and all copies of the Software that may be in your possession. The Game is an “on-line” game that must be played over the internet through a service provided by or on behalf of Maiden Gaming. You acknowledge and agree that Maiden Gaming, in its sole and absolute discretion, may stop providing support for or access to the Game at any time, for any reason or no reason. You also agree that Maiden Gaming may change, modify, suspend, “nerf,” discontinue, or restrict your access to any features or parts of the Game at any time without notice or liability to you. You acknowledge that you have no interest, monetary or otherwise, in any feature of or content in the Software or the Game. The Software is subject to all applicable export restrictions. You must comply with all export and import laws and restrictions and regulations of any United States or foreign agency or authority relating to the Software and its use. The Software may not be re-exported, downloaded or otherwise exported to, or downloaded or installed by a national or resident of, any country to which the United States has embargoed goods, or to anyone on the U.S. Treasury Department’s list of Specially Designated Nationals or the U.S. Commerce Department’s Table of Denial Orders. You represent and warrant that you are not located in, under the control of, or a national or resident of any such country or on any such list. THE GAME (INCLUDING WITHOUT LIMITATION THE SOFTWARE AND THE DOCUMENTATION) IS PROVIDED TO YOU ON AN “AS IS” AND “AS AVAILABLE” BASIS WITHOUT WARRANTIES OR REPRESENTATIONS OF ANY KIND, EXPRESS OR IMPLIED. TO THE FULLEST EXTENT PERMITTED BY APPLICABLE LAW, MAIDEN GAMING DISCLAIMS ALL WARRANTIES, EXPRESS OR IMPLIED, WHICH MIGHT APPLY TO THE GAME OR THE SOFTWARE, INCLUDING WITHOUT LIMITATION, IMPLIED WARRANTIES OF TITLE, NON-INFRINGEMENT, MERCHANTABILITY, FITNESS FOR A PARTICULAR PURPOSE, ANY WARRANTIES THAT MAY ARISE FROM COURSE OF DEALING, COURSE OF PERFORMANCE OR USAGE OF TRADE, AND ANY WARRANTIES AS TO THE ACCURACY, RELIABILITY OR QUALITY OF ANY CONTENT OR INFORMATION CONTAINED WITHIN THE GAME AND/OR THE SOFTWARE. MAIDEN GAMING DOES NOT WARRANT THAT THE GAME AND/OR THE SOFTWARE WILL BE UNINTERRUPTED OR ERROR-FREE, THAT DEFECTS WILL BE CORRECTED, OR THAT THE SOFTWARE IS FREE OF VIRUSES OR OTHER HARMFUL COMPONENTS. YOU ASSUME ALL RESPONSIBILITY FOR SELECTING THE GAME AND/OR THE SOFTWARE TO ACHIEVE YOUR INTENDED RESULTS, AND FOR THE INSTALLATION OF, USE OF, AND RESULTS OBTAINED FROM THE GAME AND THE SOFTWARE. YOU HEREBY AGREE TO INDEMNIFY, DEFEND AND HOLD HARMLESS MAIDEN GAMING FROM AND AGAINST ANY AND ALL CLAIMS, LAWSUITS, DAMAGES, LOSSES, LIABILITIES AND COSTS (INCLUDING ATTORNEYS’ FEES) THAT DIRECTLY OR INDIRECTLY ARISE OR RESULT FROM YOUR USE OR MISUSE OF THE GAME AND/OR THE SOFTWARE, OR ANY VIOLATION BY YOU OF ANY OF THE PROVISIONS OF THIS LICENSE AGREEMENT. Maiden Gaming reserves the right, at its own expense and in its sole and absolute discretion, to assume the exclusive defense and control of any matter otherwise subject to indemnification by you, in which event you will cooperate with Maiden Gaming in asserting any available defenses. UNDER NO CIRCUMSTANCES, AND UNDER NO LEGAL THEORY, WHETHER IN CONTRACT, TORT (INCLUDING NEGLIGENCE), STRICT LIABILITY OR OTHERWISE, SHALL MAIDEN GAMING BE LIABLE TO YOU OR ANY OTHER PERSON FOR ANY INDIRECT, INCIDENTAL, CONSEQUENTIAL, SPECIAL, EXEMPLARY, OR PUNITIVE DAMAGES OF ANY KIND (INCLUDING, WITHOUT LIMITATION, DAMAGES FOR LOSS OF BUSINESS, LOSS OF DATA, LOSS OF GOOD WILL, OR LOST PROFITS), OR ANY DAMAGES FOR GROSS NEGLIGENCE OF ANY KIND (INCLUDING, WITHOUT LIMITATION, DAMAGES FOR WORK STOPPAGE, COMPUTER FAILURE OR MALFUNCTION, OR ANY OTHER COMMERCIAL DAMAGES OR LOSSES) ARISING FROM YOUR USE OR MISUSE OF THE SOFTWARE AND/OR THE GAME, EVEN IF MAIDEN GAMING KNEW OR SHOULD HAVE KNOWN OF THE POSSIBILITY OF SUCH DAMAGES. FURTHER, MAIDEN GAMING SHALL NOT BE LIABLE IN ANY WAY FOR ANY LOSS OR DAMAGE TO PLAYER CHARACTERS, VIRTUAL GOODS OR VIRTUAL CURRENCY, ACCOUNTS, STATISTICS, OR USER STANDINGS, RANKS, OR PROFILE INFORMATION STORED BY THE GAME. MAIDEN GAMING SHALL NOT BE RESPONSIBLE FOR ANY INTERRUPTIONS OF SERVICE, INCLUDING WITHOUT LIMITATION ISP DISRUPTIONS, SOFTWARE OR HARDWARE FAILURES, OR ANY OTHER EVENT WHICH MAY RESULT IN A LOSS OF DATA OR DISRUPTION OF SERVICE. IN NO EVENT SHALL MAIDEN GAMING BE LIABLE FOR ANY DAMAGES IN EXCESS OF ANY AMOUNT YOU HAVE PAID TO MAIDEN GAMING FOR GAME-RELATED TRANSACTIONS, IF ANY, DURING THE SIX (6) MONTHS IMMEDIATELY PRIOR TO THE TIME YOUR CAUSE OF ACTION AROSE. Because some states or jurisdictions do not allow the exclusion or the limitation of liability for consequential or incidental damages, in such states or jurisdictions, the liability of Maiden Gaming shall be limited to the fullest extent permitted by applicable law. You hereby acknowledge and agree that Maiden Gaming would suffer irreparable harm if this License Agreement were not specifically enforced. Consequently, in addition to such monetary and other relief as may be recoverable at law, you agree that Maiden Gaming shall be entitled to specific performance or other injunctive relief, without bond, other security, or proof of damages, as remedy for any breach or threatened breach of this License Agreement. Additionally, in the event any legal or administrative action or proceeding is brought by either party in connection with this License Agreement and consistent with Section XV below, the prevailing party in such action or proceeding shall be entitled to recover from the other party all the costs, attorneys’ fees and other expenses incurred by such prevailing party as the result of the action or proceeding. A. Negotiations. Disputes can be expensive and time consuming for both parties. In an effort to accelerate resolution and reduce the cost of any dispute or claim related to this License Agreement (“Claim”), you and Maiden Gaming agree to first attempt to informally negotiate any Claim for at least thirty (30) days (except those Claims expressly excluded in Section XV.F below). Maiden Gaming will send its notice to the address it has on file to the extent that you have provided additional contact information to Maiden Gaming (e.g. by participating in a promotion or survey, or contacting a customer services representative). Otherwise, Maiden Gaming will send its notice to the email address associated with your Account. You will send your notice to Maiden Gaming, Inc., PO BOX 7546 Charlotte, NC 28241, Attn: Legal Department. Please note that this informal resolution procedure does not suspend any statutory limitation periods applicable to the bringing of a Claim. B. Binding Arbitration. If the parties fail to resolve a Claim through negotiations, within such thirty (30)-day period, either you or Maiden Gaming may elect to have the Claim (except as otherwise provided in Section XV.F) finally and exclusively resolved by binding arbitration by sending a written notice requesting arbitration to the other party. Any election to arbitrate by one party shall be final and binding on the other. The arbitration will be conducted under the Commercial Arbitration Rules of the American Arbitration Association (“AAA Rules”) and, where appropriate, the AAA’s Supplementary Procedures for Consumer Related Disputes (“AAA Consumer Rules”) that are in effect at the time the arbitration is initiated and under the terms set forth in this License Agreement. Both the AAA Rules and the AAA Consumer Rules can be found at the AAA website, www.adr.org. In the event of a conflict between the terms set forth in this Section XV.B and either the AAA Rules or the AAA Consumer Rules, the terms in this Section XV.B will control and prevail. Except as otherwise set forth in Section XV.F, you may seek any remedies available to you under federal, state or local laws in an arbitration action. As part of the arbitration, both you and Maiden Gaming will have the opportunity for discovery of non-privileged information that is relevant to the Claim. The arbitrator will provide a written statement of the arbitrator’s decision regarding the Claim, the award given and the arbitrator’s findings and conclusions on which the arbitrator’s decision is based. The determination of whether a Claim is subject to arbitration shall be governed by the Federal Arbitration Act and determined by a court rather than an arbitrator. Except as otherwise provided in this License Agreement, (i) you and Maiden Gaming may litigate in court to compel arbitration, stay proceedings pending arbitration, or confirm, modify, vacate or enter judgment on the award entered by the arbitrator; and (ii) the arbitrator’s decision is final, binding on all parties and enforceable in any court that has jurisdiction, provided that any award may be challenged if the arbitrator fails to follow applicable law. BY AGREEING TO THIS ARBITRATION PROVISION, YOU UNDERSTAND THAT YOU AND MAIDEN GAMING ARE WAIVING THE RIGHT TO SUE IN COURT AND HAVE A JURY TRIAL. C. Arbitration Fees. If we are initiating arbitration for a Claim, we will pay all costs charged by the AAA Rules for initiating the arbitration. Your share of all other fees and costs of the arbitration, including your share of arbitrator compensation, will be charged pursuant to the AAA Rules, and where appropriate, limited by the AAA Consumer Rules. Where your share of the costs is deemed to be excessive by the arbitrator, Maiden Gaming will pay all arbitration fees and expenses. D. Location. The arbitration will take place in your hometown area if you so notify Maiden Gaming in your notice of arbitration or within ten (10) days following receipt of Maiden Gaming’ arbitration notice. In the absence of a notice to conduct the arbitration in your hometown area, the arbitration will be conducted in Charlotte, North Carolina, unless the parties agree to video, phone and/or internet connection appearances. Any Claim not subject to arbitration (other than claims proceeding in any small claims court), or where no election to arbitrate has been made, shall be decided exclusively by a court of competent jurisdiction in Charlotte, North Carolina, United States of America, and you and Maiden Gaming agree to submit to the personal jurisdiction of that court. E. Limitations. You and Maiden Gaming agree that any arbitration shall be limited to the Claim between Maiden Gaming and you individually. YOU AND MAIDEN GAMING AGREE THAT (A) THERE IS NO RIGHT OR AUTHORITY FOR ANY DISPUTE TO BE ARBITRATED ON A CLASS-ACTION BASIS OR TO UTILIZE CLASS ACTION PROCEDURES; (B) THERE IS NO RIGHT OR AUTHORITY FOR ANY DISPUTE TO BE BROUGHT IN A PURPORTED REPRESENTATIVE CAPACITY OR AS A PRIVATE ATTORNEY GENERAL; AND (C) NO ARBITRATION SHALL BE JOINED WITH ANY OTHER. F. Exceptions to Negotiations and Arbitration. You and Maiden Gaming agree that the following Claims are not subject to the above provisions concerning negotiations and binding arbitration: (i) any Claims seeking to enforce or protect, or concerning the validity of, any of your or Maiden Gaming’s intellectual property rights; (ii) any Claim related to, or arising from, allegations of theft, piracy, invasion of privacy or unauthorized use; and (iii) any claim for equitable relief. In addition to the foregoing, either party may assert an individual action in small claims court for Claims that are within the scope of such courts’ jurisdiction in lieu of arbitration. G. Governing Law. Except as otherwise provided in this License Agreement, this License Agreement shall be governed by, and will be construed under, the laws of the United States of America and the laws of the State of North Carolina, without regard to conflict of law principles. The application of the United Nations Convention on Contracts for the International Sale of Goods is expressly excluded. Other laws may apply if you choose to access the Game from outside of the United States. In such an event, those local laws shall affect this License Agreement only to the extent necessary in that jurisdiction, and this License Agreement shall be interpreted to give maximum effect to the terms and conditions in this License Agreement. You are responsible for compliance with all local laws if and to the extent local laws are applicable. The New Zealand Consumer Guarantees Act of 1993 (the “Act”) may apply to the Game if you access the Game from, and are a resident of, New Zealand. Notwithstanding anything to the contrary in this License Agreement, if the Act applies then you may have other rights or remedies as set out in the Act which may apply in addition to or instead of those set out in this License Agreement. H. Severability. You and Maiden Gaming agree that if any portion this Section XV is found illegal or unenforceable (except any portion of Section XV.F), that portion shall be severed and the remainder of the Section shall be given full force and effect. If Section XV.F is found to be illegal or unenforceable then neither you nor Maiden Gaming will elect to arbitrate any Claim falling within that portion of Section XV.F found to be illegal or unenforceable and such Claim shall be exclusively decided by a court of competent jurisdiction within Charlotte, State of North Carolina, United States of America, and you and Maiden Gaming agree to submit to the personal jurisdiction of that court. YOU HEREBY ACKNOWLEDGE THAT YOU HAVE READ AND UNDERSTAND THE FOREGOING END USER LICENSE AGREEMENT AND AGREE THAT BY CLICKING “ACCEPT” AND/OR INSTALLING THE SOFTWARE AND PLAYING THE GAME, YOU ARE ACKNOWLEDGING YOUR AGREEMENT TO BE BOUND BY THE TERMS AND CONDITIONS OF THIS LICENSE AGREEMENT.